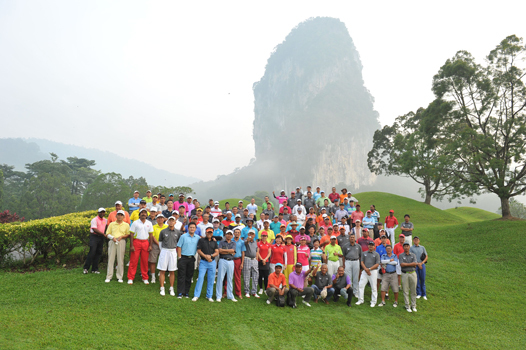 The Golf Malaysia Eagles Championship participants group photo. 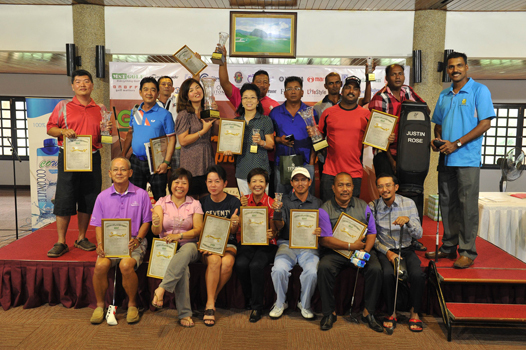 Rawang, 30 September 2014: Eagles achievers from throughout the country gathered at Templer Park Country Club in Rawang for their annual tournament, which was hosted by Golf Malaysia magazine. The Golf Malaysia Eagles Championship had a full field of 128 players all vying for the honours and hoping to be the lucky one to score a hole-in-one or Eagle to bag some special prizes. Players donned stylish charcoal grey Crest Link attire with the prestigious Golf Malaysia Eagle’s Club logo emblazoned and took to the course with relish. Every par-3 had a hole-in-one prize with a Mazda 3 just waiting to be driven off from Hole 11. MST Golf sponsored two sets of Yamaha RMX Forged Irons, one each on Hole 11 and Hole 16 to tempt the players. Transview Golf put up a set of Fourteen TC777 Irons NSPro on hole 2 and a set of Maruman Zeta Irons NSPro on hole 8 … there were no takers for any of these tempting items but it was not for want of trying! Should anyone have scored an Eagle on the day, they would have taken home an ONOFF 9” Caddie Bag sponsored by MST Golf worth RM1,290 … alas it was left unclaimed this time around. Weather conditions were perfect and the greens in enviably playing condition as the battle for top positions kicked off. The Men’s Division 1 Category (H’cap 0-12) was won by Rajendran Chandran (12) who amassed 39 Stableford points. Ali Shabuddin (10) took second, while third place was a tussle between Mohd Iqbal Hashim (10) and Ramesh Suria Narayanan (10) when both returned with 37 points. Mohd Iqbal took third on countback. Fifth place went to S. Sasikumar (5) on 36 points. In the tightly contested Men’s Division 2 Category (H’cap 13-19) three players racked up identical points and Khoo Nee Cheong (14) was declared the winner on countback with 37 points from second placed Alex Yau (13) and third placed Surendran Govindasamy (18). Mohamad Rodzi Sulaiman (19) and Yew See Rhu (17) accumulated 36 points each and Rodzi was declared the fourth place winner on countback while Yew took fifth. The Men’s Division 3 Category (H’cap 20-24) was won by Thomas Choke (21) on 36 points. Second went to Dato’ Zakaria Ahmad (20) with 35 points. Eddy Chong Ah Choi (20) happily took home third place while a countback for third and fourth took place when both players carded 32 points. Dato’ Khairul Nizam Osman was declared fourth and Raymond Sin Chee Choong took fifth. The Women’s Category was a fun affair with only five of them competing so all were guaranteed a prize. It was Elaine Chan (23) on 35 points who took top honours in her category with Fong Poh Choo (17) hot on her heels with 34 points. In third Kim Joo Yeon (15) racked up 30 points while Choi Roh Sie (18) took fourth with 29 points and rounding up the group was Patricia Lai Pik Chun (14) with 28 points. In the Invitation Category Annamali (9) took first with 38 points. Second and third involved a countback between C.C. Lim (20) and Imran Mohamad Nor (11) when both finished with 36 points. Lim came out the better on countback and took ssecond. Rashid Mahmud (14) and Ricky Hiew (22) had a similar situation when both were on 35 points and Rashid came out the better of the two to take fourth. In the Novelty contests Allan Yap won the Apple Vacations Nearest-to-Pin contest with a two foot 5 inch effort. He was the recipient of a trip to watch the Race to Dubai Golf Challenge worth RM4,900. Kelvin Chua was the Pan-West Longest Drive winner with a 302 yard effort. Every participant received a LifeStyle Chiropractic gift voucher worth RM50 and as part of the entertainment while players waited for their scores HerbaLine provided complimentary skincare treatments and a surprising number of the men eagerly joined the ladies to try out their services. They also provided gift vouchers worth RM200 in treatments as part of the Lucky Draw prizes. There were a staggering 55 Lucky Draw prizes to be given out with the Grand Lucky Draw being a Titoni timepiece worth over RM2,000 and a collectors item being a monogramed Justin Rose golf bag. Golf vouchers for Templer Park, Cleveland golf and duffle bags, Baho Belts, Gloire, PRGR and Tour Special Golf Balls and a host of other items that kept players glued to their seats. Prizes consisted of choice golf equipment and accessories from MST Golf, Prestige Golf, Transview Golf, Pan-West, TaylorMade, Epon, Srixon and Bridgestone. Participants were kept hydrated on-course and in the clubhouse with free flow of the No. 1 International Premium Beer – Heineken Beer. There was also Cowa Coconut Water, Daisy Spring Mineral Water and Isomax and Cutty Sark was the accompaniment at lunch for those who wished to indulge and add to the merrymaking.